Vancouver is the largest city in Western Canada and the third largest in the country. It's located in the southwestern corner of British Columbia and it's a famous travel destination for its natural beauty and cosmopolitan atmosphere. The city is located between the Coast Mountains and the Pacific Ocean and it has a dramatic setting and a very laid back vibe. It's regularly voted one of the best places to live. 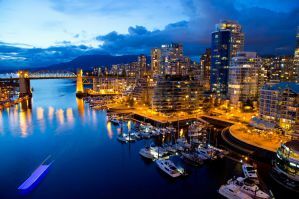 Vancouver is generally an expensive place to visit and accommodation is no exception. There are variety of hotels available throughout the city. There are also some motels that are more affordable. If you prefer the backpacker vibe, there are a limited number of hostels that appeal to backpackers and solo travelers. If you're looking for affordable and conveniently located, then the options below are may meet your needs. How much do hostels in Vancouver cost? A good hostel for couples, solo travelers, and independent travelers. Urban Hideaway is located in a Victorian era building that was built in 1896 during the west coast gold rush. It's in one of the only remaining downtown historic homes and it's a truly unique place to stay right in the heart of the city's downtown. It has the feel of a bed and breakfast, a personal home, and a hostel where it's easy to meet other travelers in a quiet and relaxed setting. There are both dorms and private rooms to choose from. The dorms sleep up to four people and the private rooms are either twin or double rooms. There are basic level, standard level, deluxe, and superior rooms that you can choose from depending on your budget and travel style. The hostel has a relaxed and personal vibe that really makes you feel like you're staying somewhere unique. There's a roof top sun deck with flower gardens that is a nice place to spend time. There's also a library, laundry facilities, luggage storage, free wi-fi, and a large kitchen if you prefer to prepare your own meals. Every morning there are supplies available for you to prepare your own breakfast. This includes Canadian bacon, eggs, vegetables, pancakes, cereals, fruit, coffee, and more. If you want a relaxed and comfortable place to stay in Vancouver, then Urban Hideaway Guesthouse is a great option. A good hostel for backpackers and young travellers. St. Clair Hotel and Hostel is located in a 1911 building that was originally built by the Captain of the Empress of Japan Canadian Pacific Steamships. The hotel's decor still reflects its nautical past. This is a quaint and comfortable place to stay that has a bit of an old fashioned vibe. There's a lot of charm and character here and you can be assured an enjoyable stay at an affordable price. The accommodation is a bit hotel and a bit hostel. There are shared dorms available that sleep up to four people and appeal to budget travelers and backpackers. There are also private double, triple, and quad rooms available. The bathroom facilities are shared but private rooms do have their own sink. Wi-fi is available throughout the hostel. This is an affordable option that appeals to young travelers and people on a budget. The location is good and the staff are helpful. A good hotel for budget travellers. Hotel Ambassador is another good option for budget travelers. It's a boutique hotel that has affordable rooms and a comfortable setting. It's also in a convenient location and is walking distance to a variety of outdoor activities and major sporting venues. If you're more interested in shopping, you'll find some of the city's best shopping areas nearby as well. Hotel Ambassador offers a good value for all types of travelers. The setting is relaxing and the staff are available all day to help with any questions you might have. The facilities are simple but reliable and the staff and other guests are respectful. This hotel is a good option for budget travelers who want to be centrally located but don't need a lot of space or frills. It's a relatively quiet place to stay with the standard amenities.